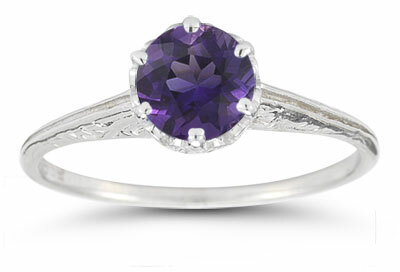 Purple color is given a royal greeting in this radiant gemstone ring from Apples of Gold. A single, round cut amethyst stone brings a violet hue of outstanding beauty and is set in six prongs of 14K white gold. This white gold setting features an elegant pattern that not only secures the amethyst stone, but also mounts it with the band for the best display. The band is equally alluring with a swirling paisley motif that tapers into a thin, smooth band. We guarantee our Vintage Prong-Set Amethyst Ring in 14K White Gold to be high quality, authentic jewelry, as described above.